The fabrics listed below are no longer limited to just binding carpet. By offering them in widths from 15’6” down to ½ inch, Syntrex greatly enhances the versatility of all their fabrics. The possibilities are limitless. Because of uniquely advanced equipment, Syntrex is able to produce uncommonly fast turnaround on large or small commissioned orders. Custom color copying and matching are accomplished quickly and precisely with a high-level, industry-standard spectrophotometer. 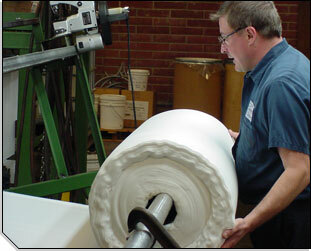 On-location dye facilities allow processing in widths from 40 inches to 15 feet, and exceptionally accurate slitting capabilities produce fabrics as narrow as ½ inch. 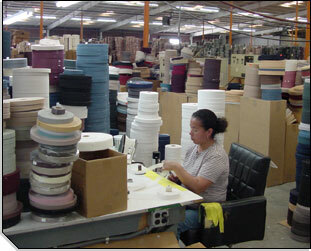 The Syntrex portfolio of services also includes ultrasonic bonding of fabrics. Using technology not commonly used for commissioned jobs, two fabrics of difference compositions can be fused together with heat generated by ultrasonic sound waves. Please contact us for more information.